There’s nothing like a sea journey to fill you with anticipation and a sense of adventure and although it’s a relatively short hop across the Cook Strait, the Interislander ferry nevertheless gives you that sense of adventure as you make the transition from New Zealand’s populous North Island to the wilder South. Not that there’s anything particular wild about Christchurch, the principal city of South Island. Indeed, it prides itself on its Englishness, with its red telephone boxes and the River Avon gently flowing through the city centre, home to dozens of Oxbridge-style punts. At the city’s heart is Cathedral Square, where you’ll find the Anglican building which gives the city its name. Here you’ll also find New Zealand’s own Speakers’ Corner, which works pretty much the same way as the one in London’s Hyde Park! You’ll also find trams, although the system is little more than a tourist attraction now. The trams ceased operations altogether in 1954 but returned to the inner city, on a restricted loop, in 1995. Still, there’s no shortage or rail and bus connections either. Christchurch is full of posh little boutiques and unusual shops as well as the expected big brand names and its compactness makes for an easy and enjoyable shopping experience. Its other main attractions are natural, with a welter of botanical gardens, parks and bush. The other big city (although, on South Island, such expressions tend to be very much relative) is Dunedin. Whereas Christchurch affects a conciously English air, Dunedin has tartan in its blood. The Lay Association of the Free Church of Scotland founded Dunedin at the head of Otago Harbour in 1848 as the principal town of its Scottish settlement and there’s no shortage of shortbread, bagpipes and Scottish country dancing for those so inclined! The cityscape glitters with gems of Victorian and Edwardian architecture - the legacy of the city’s gold-rush affluence. Many, including First Church and Larnach Castle designed by one of New Zealand’s most eminent architects RA Lawson. Other prominent buildings include the magnificent railway station (pictured), from where you can catch a number of tourist excursions. Dunedin is home to the huge Cadbury factory that manufactures all the chocolate manufacturer’s output for the Southern Hemisphere. As with its sister plant in Birmingham, England, there’s Cadbury World, a chance to take a tour of the factory and chomp your way through some complimentary products at the same time - just don’t go there before you’ve had your lunch! Head west and you’re really getting into wild New Zealand. Queenstown is built around an inlet on Lake Wakatipu, a long thin lake shaped like a staggered lightning bolt, and has spectactular views of nearby mountains. If you ever had a hankering to try out extreme sports, Queenstown is the place to realise those ambitions. 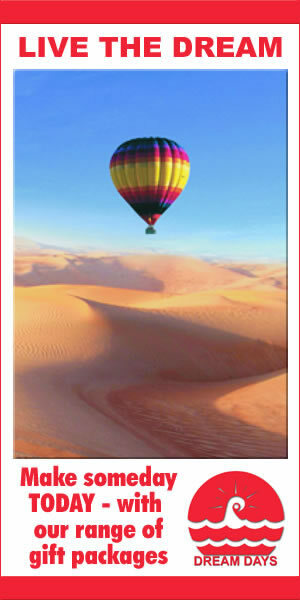 It’s acknowledged as one of the world’s best places for “adventure tourism”. You can bungy, ride in jetboats on the lake, river surf, mountain bike, paraglide and even take your chances on a canyon swing. If all that sounds too exhausting or scary, a lake cruise on the TSS Earnslaw (pictured) is the perfect antidote. 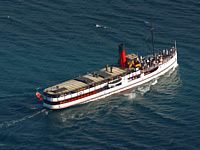 This 1912 vintage twin screw steamer is one of the oldest tourist attractions in Central Otago. For all the high adventure, it’s the spectacular scenery that abides longest in the memory for those who make it to this part of New Zealand, especially as you travel into the wildest outposts of its fjord country. The most famous destination in the fjord country, and in New Zealand, is the spectacular Milford Sound, which author Rudyard Kipling dubbed the eighth Wonder of the World. Milford Sound runs 15 kilometres inland from the Tasman Sea and is surrounded by sheer rock faces that rise 1200 metres or more on either side. It’s most distinctive summit is Mitre Peak, in the distinctive shape of a bishop’s headgear. Walking in the fjord country is a serious proposition and only seasoned hikers should stray far from the beaten track. For the less athletic among us, the best two ways to see Milford Sound are by boat - there are plenty of ships plying its waters - and by helicopter, which will also land you up on a glacial snowfield. It’s a seriously memorable end to your journey through a seriously memorable country. It’s a cliche, but New Zealand is one tourist destination that can truly claim to “have it all”.